Hope you can help. I have a Vitodens 200 with a 53 gallon single coil tank right now - radiant panel heat. Family of 4, avg to above age DHW use (2 girls). We plan to add evac tubes to our New Hampshire home but get conflicting reports on how much space heating we will get. Some say 2 panels of tubes (60 total Viessman or Thermomax) will give us DHW plus ample swing season heat, while others say 3 panels, or even more are required. Then there is tank size (80 gal dual coil for the 2 panel, 115 for the 3 panel) and cost. $14k for a 2 panel, but $21 k for the 3 - I assume because of a larger tank and piping? The question is - how much space heating do people in the north realistically get with 2 vs 3 panels, and is the extra cost justified? Should I be specing a different tank size for a 2 or 3 panel than what is proposed? Are there different ways to pipe this too? I have seen standard Viessman 2 tank schematics, but also hear of alternate approaches where solar water is injected into system just before the boiler, but the tanks are not connected to each other...is that OK? I know you need more specifics but looking for a rough guess to help - 2800sq ft home, southern exposure, home insulated well and has slightly better than average air loss on a blower door test. If i had a nickle for every plumber or solar installer who claims he can heat a home in Maine or NH with solar thermal, I'd be a wealthy person. Solar thermal systems contributing to space heating can be fantastic, but they aren't easy to do properly and unfortunately, a lot of installers seem happy to overpromise anyway (or they simply don't know any better and just parrot what the sales guy told them). We've installed several dozen large solar space heating systems in the last 5 years, but I've also advised at least twice as many customers against it in the same time period. 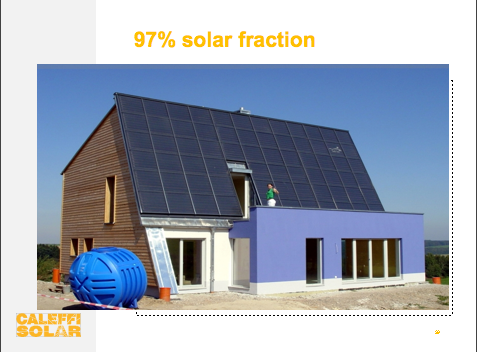 see: http://www.revisionenergy.com/pdfs/solar-space-heating.pdf for some more info about when it does or doesn't make sense. If you do in fact have above average DHW load a 60 evacuated tube solar thermal system won't provide much, if any, production beyond what you need for the domestic during the heating season. On a good spring or fall day in NH, a 60 tube Viessman system will provide you something like 50 to 60,000 BTU. If your family uses 80 Gallons of hot water a day, that is about 47,000 BTU so in the best case you might have something like 15,000 BTU 'left over' for space heating. And the situation only gets worse as you move into the winter months when you need more heat and the day is shorter. Unless the DHW and space heating loads are tiny, I don't think you'll be able to justify the cost of tying into the heating system with a 60 tube system. Even the 90 tube system might be marginal based on your description of the house. and 80 Gallons is definitely too small for 60 evacuated tubes, and 115 G is too small for 90. At those tank volumes you'll be wasting a lot of available energy through a good chunk of the year. 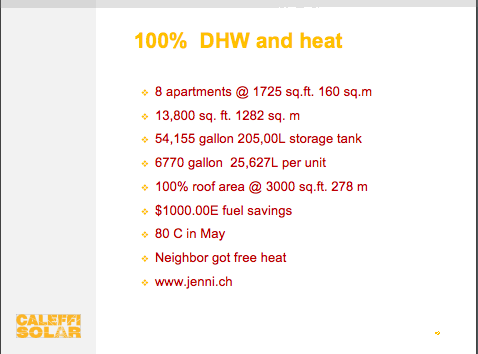 If you have a family of four and above average DHW load, you should be in a 115 G tank for solar DHW alone. Thank you for the comments! I had seen some ESOP simulations that made space heating questionable with 90 tubes, and more practical with 120. I am a bit confused on tank size, as we already have a single coil 53 gallon. Even Viessman own doc show a 80 (or 72 gal) dual coil as a second tank. One installer said he had learned a new piping scheme where water from the dual is injected into the system just before the boiler, fooling the boiler into not having to come on as frequently as the return temp is higher. The 53 gal single coil is then the DHW source, with the dual as the BTU storage to feed heat and boiler return. regardless of where you tie solar into the heating loop.. if it the solar energy isn't available, like a cold winter sky in NH....you don't have any solar energy to contribute. With that size array and a reasonable budget I would just go for the DHW load. A solar preheat tank in series with the indirect you have would be a nice start. 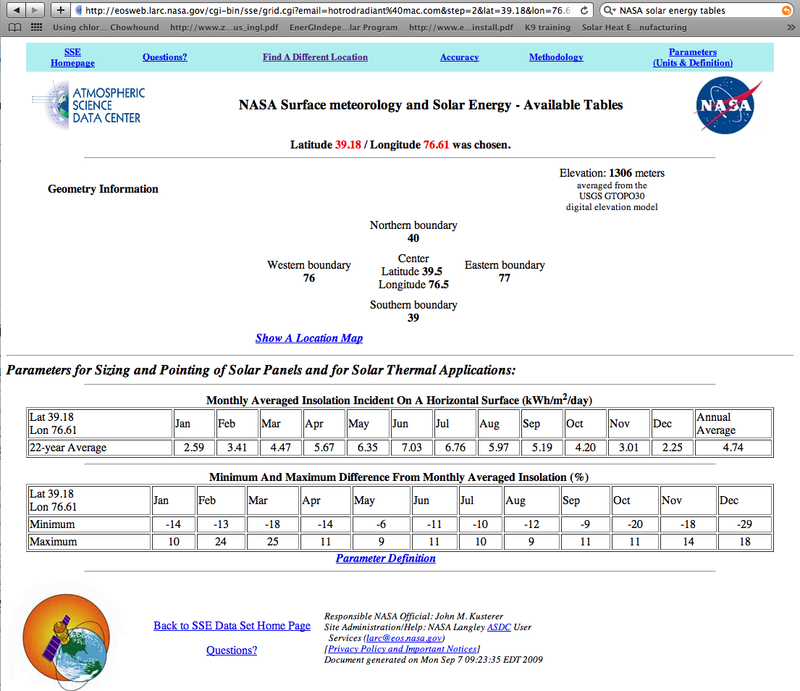 There are websites that show the amount of solar radiation available at various months of the year. Go to this NASA site and plug in your lat. and long. Notice how much the solar radiation drops off in the cold winter months. One question about storage - I have heard store as much BTU as possible (for a rainy day so to speak) but others say collect and use immediately, thus using a smaller storage tank. What is your opinion here- is one more efficient than the other? Most spec 80 gallon but you advise 115.....I have even seen a system (Sunda) with 160 gal tank! What about heat dumps with 2 panels? Your simulation agrees with my previous post. The space heating solar fraction of the proposed system is less than 1% (448,000 BTU out of an annual heat load of 141,000,000). This is partly because the space heating tank is unreasonably small (50 gallons?) but I think it is fairly obvious that even with a smarter design, with this amount of collector area, the space heating portion of this install is a waste of time and money. For domestic tank sizing: If you are talking about a preheat tank, then a smaller tank may be sufficient, if you include some means of moving heat from tank to tank (like a small bronze pump) so you can use the total storage volume for solar storage. you need a lot of surface area of collector and a lot of tank. Here are a few examples of high solar fraction heating and DHW applications. You can see the size of the arrays to get those type of SF. These are in Europe, Switzerland and Germany. I'm a huge fan of solar thermal, you need to spend time on the design and be realistic in your expectations. So it sound like there is no advantage to 3 panels over 2 in my situation, especially considering $7k cost difference. So even with 2 you would go with a larger tank - is it still worth piping for space heat on the off chance we get some days with extra BTUs to use? Examples of best practices in piping? I hear different opinions of how to do with 2 tanks (we have a single coil 53 gal Vitocell 300 now). I prefer the flat plate collectors. Look at the winter month radiation. A couple % more output, from tubes, when there is little or no radiation doesn't really add much. Initial cost and life span is more important, to me. Flat plates shed snow better, and have an incredible, long, documented life expectancy. 30 years is not un-heard of with flat plate. How many 30, even 20 year old evac tubes in your area? If the goal is to provide solar assist to an already existing indirect I would consider a 3 collector 80 gallon system. You can play "what if" games with RET Screen. It shows output, SF and economics as you adjust collector to storage %. I am currently trying to design my first domestic HW and space heating solar system for my 3500 sq ft home. I found a collector that is very powerful, average of 35,000 btu's per hour in full sun (solarbeam.us). 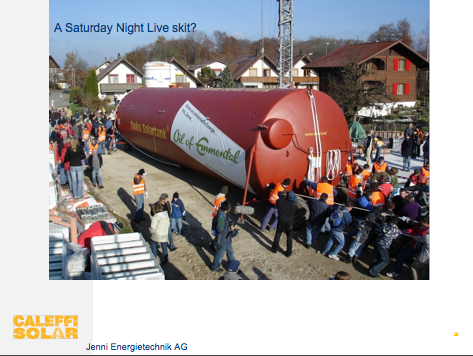 The biggest question I have is what size storage tank. I am looking at an unpressurized tank of about 550 gallons, with 3 heat exchangers, one for solar collector, one for HW, and one for radiant baseboard. Currently my home uses a 160K btu oil fired boiler with a tankless hot water exchanger built in. The house avaerages about 800 gallons of oil used per year, HW and Heat. A tank company gave me this 550 gallon tank storage size, but do designers sometimes first send the solar closed loop hot water to a smaller tank just for domestic water, and then send any extra hot water to the bigger storage tank for space heating and backup? I also just read about variable speed circulators. Whether this makes sense or not in your particular case depends on a number of variables. In general, when the fuel source being offset for DHW and space heat are the same, I tend to believe that during the heating season it makes sense to use the BTU's wherever you need them and that prioritizing DHW doesn't make much sense. Of course in the non heating season, a DHW priority makes lots of sense. On another note, I'm deeply skeptical of the claims made by the collector manufacturer you mention. Before you send them a check, I'd wait for an SRCC rating of the collector (which you will need anyway if you want to claim a tax credit and which they claim is coming this month). Their claim that they can generate 44,000 BTU per hour from the dish sounds super impressive, but the devil is in the details. 44,000 BTU/hr from that 170 square foot dish comes out to be about 255 BTU/hr/sqft, which is an 83% efficiency (assuming 1000W/m^2 insolation). has an 88% efficiency (170 sq ft of it makes 46,000 BTU/hr) as long as the fluid temperature and the ambient temperature are the same. I admire your enthusiasm, but I'm not sure that concentrating parabolic collectors are a good choice for the DIY solar market. Before you pull the trigger on these collectors, consider asking the rep if he can point you to half a dozen or so other installations where you can talk to happy homeowners. Like Fortunat, I'd be leary of anyone who claims their product is 200+ % more efficient than a flat rate collector. It might have the ability to collect more energy due to its dual axis tracking ability. The one distinct advantage it would have is that once the storage tank is maxed out, it can go out of focus, and avoid generating high temperature/pressure steam. 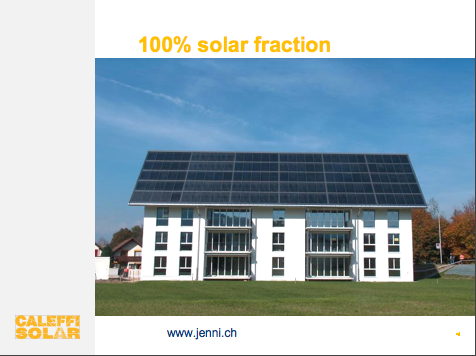 Bottom line, there is only some energy per square foot per hour available. The end temperature is a function of concentration, or not. A BTU is a BTU is a BTU, regardless of the source, and it can only do so much to a pound of water... Keeping fluid temperatures as low as possible is ALWAYS a good idea, where applicable. I also think they look very cool. They will have their SRCC rating in 5-10 days, I was told. So how does one determine the proper size storage tank(s) and number of tanks for solar DHW and Space Heating? Is there a program you experts use? This seems to be very important, as if the tank is to small you waste the extra solar thermals, and if the tank is to large, you can never get the tank water up to the desired temperature? I was going to change over my current standard baseboard to the low temp baseboard that is called "Heating Edge", which will put out the same BTU's per foot at 90 degrees, as the standard baseboard at 180 degrees. It simply uses a double copper line and added fins. I have 120 evacuated tubes and two large storage tanks. The primary tank, used to deliver domestic hot water, is about 200 gallons. The second tank, used to pre- heat the domestic and to provide space heating, is about 1500 gallons. I'm really happy with the performance of this system, but like Hot Rod, I would go with flat panels next time. I have four failed tubes in about five years and I would expect a good flat panel to last many decades. The smaller tank heats up quickly to provide all of my hot water needs, the larger tank harvests even more BTU's without ever needing to dump any. Using the larger tank during the heating season allows me to harvest much more energy, because I'm collecting energy at only 75 or 80 degrees, I also end up using my house to store energy when the sun is shining, keeping the tank temperature low to harvest the maximum amount of energy. I would not replace the baseboard. I would use it as a primary heat source from your boiler, and install a separate low temperature radiant panel to deliver solar energy as a secondary heating source. This way you can harvest, and use, low temperature BTU's on every sunny day during the heating system, not just during the shoulder season. During the non- heating season I use the smaller tank as a conventional system with increasing temperatures throughout the day. While you will forgo some BTU collection this way during the summer, you will end up with a hotter small tank because you can't use much of the low temperature BTU's anyway, except to pre-heat your domestic, which will make your smaller tank stay hot much longer.